Selections from an Easter Sunday Worship Sponsored Service at The Unitarian Universalist Congregation at Montclair by Rev. Charles Blustein Ortman and Rev. Judy Tomlinson. 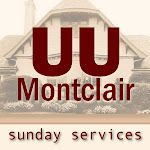 Selections from a Sunday Worship Service at The Unitarian Universalist Congregation at Montclair by Rev. Charles Blustein Ortman. Selections from a Worship Committee Sponsored Service at The Unitarian Universalist Congregation at Montclair by the UUCM Senior Youth Group.